A different print is featured each month. 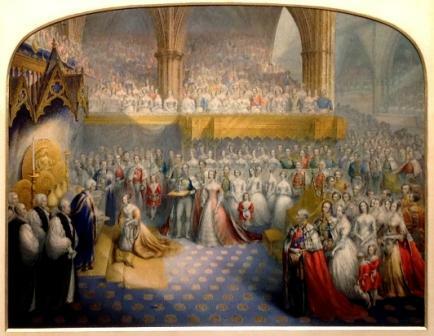 Sketched by Baxter at the ceremony on June 28th, 1838, from the gallery occupied by the Foreign Ambassadors in the Abbey. Printed by George Baxter using his patented process and published October 1st 1841. It is probably these likenesses, and the individual sittings for them, that account for the three-year production time of this particular subject. The print was issued in 12 different states including a full height print and a half height print with domed top (like the one pictured here), both of which could be had varnished or unvarnished. Prices were £5 5s. large size and £3 3s. small size and highly finished proofs were sold for £10 10s. This print is one of over 150 exhibits in the New Baxter Society Spring Feature Exhibition, at Arts & Antiques for Everyone at the NEC 4th to 7th April, 2019. Please come along and see us there.